Keweenaw, the northernmost part of Michigan’s Upper Peninsula, is most famous for its association with an American copper boom in the late 19th century. That’s where you’ll find me, in close proximity to the Quincy Smelting Works my original owner once oversaw. Between 1880 and 1882, the Quincy Mining Company built me as a home for its top mine agent. My lavish Italianate Victorian detailing was handled by specialists and helped signal the agent’s stature in the community—I’m much more ornate than the mine company’s other domestic buildings from the period. My 9,000 square feet and 3.25 acres of land helped me serve as a social hub around the mine. Today, I’m the last standing mine agent’s house in the area and a symbol of the ways Keweenaw’s geological riches shaped its social and community development. For example: During the region's boom, my attic likely held dances and meetings, and my "dungeon," the labyrinth of connected rooms below me, might have been a makeshift jail or asylum. My elaborate details will make you feel like a pillar of the modern-day community. I have a widow’s walk that overlooks the Keweenaw Waterway and two porches—one enclosed on the side and another stretching across my front entrance. On a clear day, you can see as far as Lake Superior. 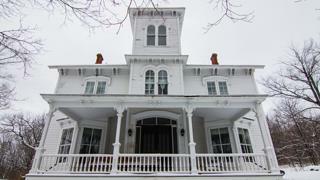 Inside, my 19 rooms include two parlors with original white pine trim and impressive high ceilings. My location is unmatched if you’d like to enjoy outdoor recreation or historic tourism in the Upper Peninsula, but my acreage and a standing two-story horse barn mean you can enjoy yourself just as easily from the comfort of home. If you’d like to imagine yourself overlooking historic copper country from my many beautiful rooms, read my listing here. 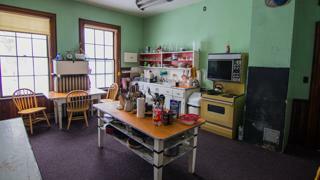 My large kitchen was likely updated in the 1920s. 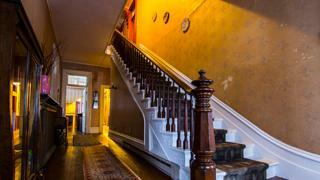 My main staircase takes you to six upstairs bedrooms.